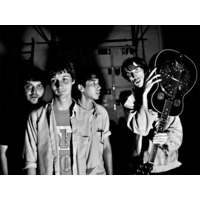 Deerhunter is an American four-piece indie rock group originating from Atlanta, Georgia. The band, consisting of Bradford Cox, Moses Archuleta, Josh Fauver, and Lockett Pundt, have described themselves as "ambient punk," though they incorporate a wide range of genres, including noise rock, art rock, shoegaze, and post-punk, as well as significant pop elements. The band has gone through several line-up changes and the death of a member.